In July 2013, the Chicago Park District revised the requirements for instituting a ‘Dog Friendly Area’ and the responsibilities of DFA Committee with respect to maintenance of the off-leash dog area. Anyone interested in instituting a DFA should read this document closely, keeping in mind that ‘regulation’ and ‘practice’ often do not coincide. 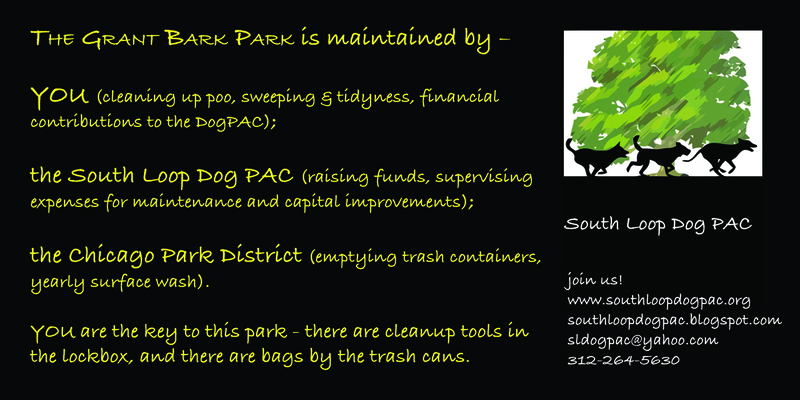 South Loop Dog PAC will be happy to discuss our experiences with DFA management and with the Chicago Park District with any interested parties. The 2008 requirements document is also available on our site (and forms the basis for the following). All ongoing maintenance The DFA Committee and members must assist in the maintenance of the DFA. It is the responsibility of the Committee and members of the DFA to clean up after their pets; rotate, bleach and replace any pea gravel areas, including removing pea gravel and waste that has spilled outside of the dog friendly area; wash down the hard surface area bi-weekly; power wash hard surface area 3 – 4 times per year (schedule this with the Chicago Park District Area Manager); and on a daily basis, clean up any waste that other users may have missed. The DFA Committee of all beach areas are responsible for the ongoing daily clean up of the area including trash pick up and waste pick up. The regular users of the DFA should inform new users of the DFA rules and regulations as well as the importance of maintenance. The DFA Committee must provide the Chicago Park District with a monthly cleaning schedule and must sign the Use Agreement referred to in Steps 3 and 4 stating their agreement to maintain the DFA. Monitoring DFA use The DFA Committee and members of the DFA shall assist in the monitoring of the DFA. The DFA Committee members should encourage the enforcement of the leash laws outside of the DFA, monitor the behavior of the dogs and dog owners using the DFA, and assist in the education of new users. DFA Committee and members of the DFA shall educate users of the Chicago Park District rules and regulations for a DFA, including the license requirements. Management of the DFA The DFA Committee should communicate frequently with the Chicago Park District regarding the management of the DFA. If problems occur with the operation or patrons of the DFA, the Chicago Park District must be informed and involved in the resolution of the problem. Fundraising for improvements The DFA Committee should organize fundraising campaigns to finance new projects for the DFA such as a doggie drinking fountain, an information/bulletin board; an isolation area or an agility area; noncapital improvements & repairs; a storage shed for hose, waste bags, and cleaning supplies; new benches; non-standard Chicago Park District DFA design element repair or replacement; and upgrades of standard design elements. Clean-Ups The DFA Committee and members should hold semi-annual entire park cleanups in conjunction with the Friends of the Parks, Earth Day, and Clean and Green celebrations. Funding to 50% Dependent on the availability of funds, the Chicago Park District may absorb 50% of the total standard project cost up to a maximum of $75,000 (the standard construction cost of a DFA is $150,000). Maintenance of capital projects Capital projects – sewer repair, fencing or gate repairs, asphalt replacement, site furnishing repair or replacement, landscape improvements, fountain repair or replacement. 50/50 funding of the repair or replacement of any Chicago Park District DFA standard design element. Community Support Support and assist in organizing community meetings; supply guidelines, rules and regulations, standards, sample petitions, sample usage surveys, and site plans for proposed DFA; attend meetings as needed.